„Ever since coming first to St. John in 2012, I have been wanting to do that. The island extends only 8 miles from West to East and about 5 from North to South (about 19square miles / 50 square km). I figured the circumnavigation would be about 20-30 miles. The distance is not really a problem, but it’s usually very windy and there are strong currents and big waves, especially around the tips (Mary’s Point in the North and Ram’s head in the South, where the Carribean Sea meets the Atlantic Ocean). The prevailing wind direction is from North East to South West. 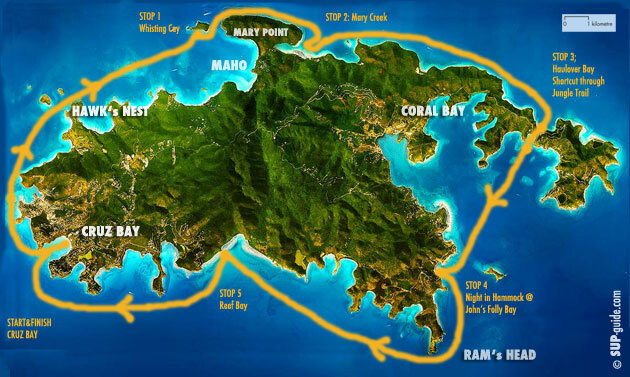 I had done a few upwind paddles to Maho / Mary Point and a some downwinders from Reef Bay and Fish Bay back into Cruz Bay, but I had never been further East than Mary Point in the North and Reef Bay in the South and thus had no idea which conditions to expect. I had consulted a few locals and they told me that the channel after Mary point can be rough and that the area around Ram’s head is a fierce “washing machine”. Plus there are tiger sharks…. The average wind speed around St. John is about 20knots, often times 35 and more, making it impossible to even paddle the 5 miles to Hawk’s nest. So kept waiting for a really calm day. The forecast for the weekend of July 13th looked good, wind was only 7-12 knots, the lowest I have ever seen in my time over here, but it would be hot, 32°C / 90°F. I packed my Garmin GPS, 1 gallon of Gatorade, 10 cereal and energy bars, 5 energy gels, 2 phones, a hammock with mosquito net, a change of clothes and 2 peanut butter jelly sandwiches and made my way down to Cruz Bay with my 14’ Falcon. I took the smaller Kia Loa Methane Paddle, which I had used for the 220km Eleven City Tour and the 62km Ultramarathon in Podersdorf. The plan was leave from Cruz Bay, North-East into the upwind, continue through the upwind along the Northern coast of the island and then take a walking shortcut at Haulover Bay, to avoid paddling around East End tip. My boyfriend Steve, who is a boat captain had advised me to then go straight to Ledduck Island (avoiding the Ram’s head area) and from there it should be almost a straight open ocean downwinder back into Cruz Bay. This route was the best in terms of wind and current, but in terms of stops and sustenance it was not ideal. On the first leg there are plenty of beaches, Honeymoon, Cinnamon, Maho &Trunk Bay where you can stop and get water or food, but after Mary Point there is nothing. Also, doing the hard open ocean paddle around Ledduck and Ram’s head washing machine with big waves and currents of 2 oceans meeting towards the end when being tired did not seem ideal. I left Cruz bay at about 10.00AM, yes, that was a bit late, but the packing / getting the stuff down to Cruz Bay took a while and I am not a morning person at all. The wind was calm and I took the outside line straight towards Mary Point, without stopping at any of the beaches to get more water. It was a really calm day and up to there the paddle was not too bad, a constant upwind of about 10 knots, but no mean gusts. The heat however was burning on my head and wearing me out. My first stop was Whisling Cay, a tiny island off Mary Point. I sat in the shade for a few minutes and had 2 energy bars and refilled my Camelback from the half gallon of Gatorade that I was carrying. Unfortunately, when taking the board out of the water, one of the handles from the glued on deck rigging kit came off, so from that point on my gear kept moving around on the board, which was annoying. I continued my journey passing Mary point in the North into the open channel between Little Thatch Island / Tortola and St. John, the upwind was getting stronger and I also had to paddle against the current. That part was a bit of a drag, so after Mary’s Point I could not resist going downstream into Mary Creek, until I was in less then 1 foot shallow water with rocky reef bottom. Ok, this was not the smartest detour. Just when I was paddling upstream out of the Creek again, I saw my boyfriend passing by on a rescue mission to get a boat that had broken down. That was good luck as it got me 2 additional water bottles when I paddled over to meet him. After that came another 6 mile upstream paddle in an area with no civilization at all. I was looking for what I was told “really flat area of land” which would allow me cross by foot to the South coast, Haulover Bay. I kept paddling and paddling until I finally saw what looked like the flat area of the island. (after having taken a few detours into the bays that had no flat areas….). The “footpath” from there was more like a jungle trek/hike through bushes and mud, climbing over fallen trees with my 14’ Falcon and heavy bag. I cursed myself for not having brought any shoes but thank god did not have any animal encounters, except for hundreds of colorful butterflies. Finally, I saw the turquoise water at the end of the path and arrived at a beautiful tiny beach. There was an elderly couple sitting on the beach. They kindly gave me their remaining ice cubes from the coolbox. By then it was already about 4:30PM and I had the choice to either paddle into the civilization of Coral Bay to the right or head straight into the ocean to cross over to Ledduck Island. Paddling into Coral Bay would have been a safe place for the night, but a big detour, so I started to paddle towards Ledduck. The wind was picking up and now blowing from the side. I wasn’t sure I would make it back before darkness and I did not feel like spending the night alone on (uninhabited) Ledduck Island as it did not look like it had trees suitable to hang a hammock. So I paddled towards the South-East Coast of St. John, which has 3 beaches with a few houses, Johnson Bay, Frits Bay and John’s Folly bay. I decided to paddle into the last one. By that time I had paddled 26km in upwind and sidewind, against the current in 5:25 hours. The next 18km would be mostly downwind except for a tough paddle around Ram’s Head with strange whirls from waves and currents from 2 different sides. I decided it would not be smart to embark on that paddle so late in the day, the sun would be setting soon and there would not be a chance to stop or spend the night for at least 10km. So I put up my Hammock right in front of the ocean in John’s Folly Bay. There was house right up the hill and the kind owners invited my to take a shower in one of the guest rooms and even brought me a bowl of pasta out to my hammock. What a delicious treat after all the energy bars! So I spent a windy night in my hammock. Unfortunately, I had changed into my only long sleeve to avoid sunburn and had fallen in right before pulling into the bay, so that was wet now. I covered up in a tiny, moist, sandy beach blanked instead. I watched a beautiful sunrise and continued my journey at 7.00 AM. The wind had picked up after night and getting around Ram’s head was no fun at all. I fell in a few times and was swearing a lot. Maybe I should have taken my boyfriend’s advice and paddled to Ledduck, but there I would not have had cell phone reception to let him know I would not be home for the night…. After that rough part finally came the nice part. I had an awesome paddle with wind and current , riding nice waves right into Reef Bay. got a few dings and reef cuts when getting out of the shallow water, sent a text that I would be home for breakfast and was off again into a bit of upwind to get out of Reef Bay, followed by another awesome 10km downwinder back into Cruz Bay, where I arrived at 9:30 AM, after 44km and 7:56 hours of paddling and not spending a single dollar on the way. Fancy Paddling in this beautiful setting yourself? 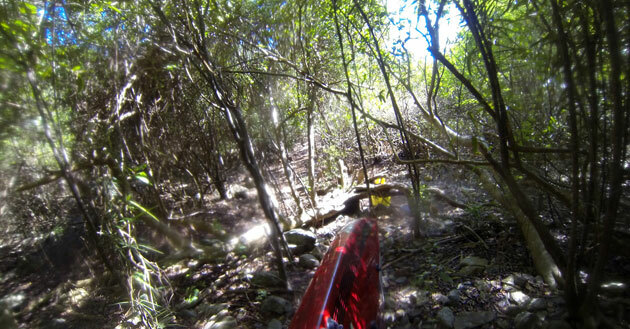 Check out www.sup-stjohn.com and http://go-hiho.com/index.cfm?fuseaction=hiho.main.